By 2030 the world will need to build approximately $85 trillion in low-carbon climate-resilient (LCR) infrastructure in order to meet the Paris climate change agreement’s goal of keeping the global average temperature increase well below 2 degrees Celsius by 2050. Meeting this infrastructure investment need will require doubling today’s global capital stock. This paper defines LCR infrastructure as including renewable energy, more compact cities, and suitable mass transit as well as energy efficiency measures. Whether the world builds LCR infrastructure will also determine whether the Sustainable Development Goals (SDGs) are achieved. Around 60 percent of LCR infrastructure needs are in developing countries. 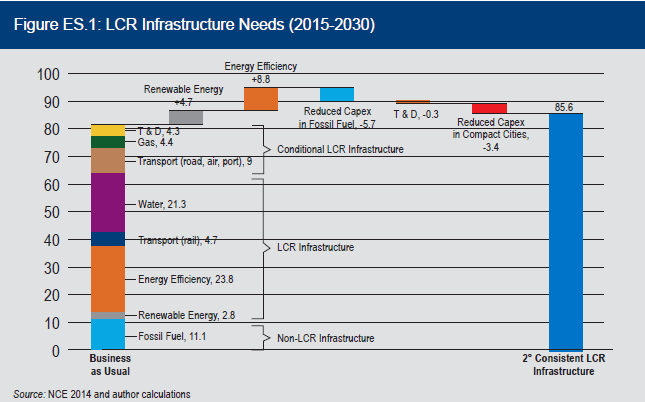 LCR infrastructure links the climate and development agendas in multiple ways. For one, the impact of climate change is being felt most acutely by the poorest and most vulnerable people in developing countries. This link between climate change and poverty is reflected in the SDGs, which recognize addressing climate change as a development outcome. Infrastructure also has a direct effect on development outcomes. For example, building renewable energy instead of coal-fired power stations can reduce air pollution and produce better health outcomes. Building compact cities with access to mass transit affects access to other key services such as health and education. Figure ES.1 shows business-as-usual (BAU) infrastructure investment as well as the additional investment in LCR infrastructure needed to be consistent with the below 2-degree Celsius climate goal. As can be seen, investments under BAU over 2015-2030 would likely include significant investment in LCR infrastructure in the range of $53-$70 trillion. The large range reflects the conditional nature of some of the infrastructure being built under BAU. For instance, gas-fired electricity could be consistent with a below 2-degree Celsius gain scenario if gas is a bridging fuel towards a zero-carbon electricity sector. Because public finances are constrained, private capital will be required to meet these LCR infrastructure needs. Increasing private investment into infrastructure can also deliver efficiency gains. Fortunately, there is no shortage of private capital globally. In particular, institutional investors have assets under management of $85 trillion and this is expected to be over $110 trillion by 2020. However, current allocations from institutional investors into infrastructure are low—approximately 1 percent of total asset allocations. Moreover, there is a shortage of other private capital for infrastructure, particularly LCR infrastructure in developing countries. The lack of investment in infrastructure by institutional investors as well as the private sector more broadly is due to infrastructure risks and other barriers. Moreover, LCR infrastructure carries additional risks. For instance, a limited (or complete lack of) investment track records for new climate technologies raises risk. Reliance on government support for LCR infrastructure such as feed-in-tariffs or subsidies creates additional political risk. LCR infrastructure risks are also higher in developing countries, given greater political instability, poor investment environments, and currency risks. LCR infrastructure risks vary over the project lifecycle. For instance, risks are high in the early project preparation stage, due to challenges related to developing often complex infrastructure plans and obtaining permits. As project construction commences, risks grow due to macroeconomic and business uncertainties as well as possible construction delays, permit cancellations, and sudden shifts in the availability of finance. It is not until the project is operating that cash flow turns positive, risks decline, and it is finally possible to deliver a return on investment. A key consequence of these LCR infrastructure risks is that the cost of capital climbs and finance becomes scarce. For instance, the high risks during project preparation and construction has meant that available private finance is most often sponsor equity and short-term bank loans. Yet, even here private investor interest is limited, and this is particularly the case for LCR projects in developing countries. This in turn stymies LCR infrastructure projects and diverts investment into what is often lower-cost but higher-carbon alternatives. Addressing these LCR infrastructure investment challenges requires aligning public and private finance in a manner that allows for the full risks to be borne. The MDBs have the knowledge and financial position to play a central role in blending their own capital with climate finance to reduce risk and crowd-in private sector capital. MDBs are increasing their climate investments, yet they face constraints in terms of the amount of finance they can provide and the risks they can accept. For example, except for grants by the International Development Association (IDA), which are only for low-income countries, concessional finance by the World Bank still needs to be repaid.2 In effect, this constrains MDB risk appetite. Among the ranks of global climate funds, seven can be categorized as multilateral climate funds (MCF): the Green Climate Fund (GCF); the Global Environment Facility (GEF), which has responsibility for the Least Developed Countries Fund and the Strategic Climate Change Fund; the Adaptation Fund; and the two funds within the Climate Investment Funds Funds (CIF)—the Clean Technology Fund (CTF) and the Strategic Climate Fund. This paper focuses on the CIFs, the GEF, and the GCF, which represent over 90 percent of multilateral climate finance. The MCF are blended finance facilities designed to co-finance with other public and private sources of capital. The MCF can have the greatest impact financing LCR infrastructure by providing small amounts of highly-concessional finance alongside other public finance to reduce risk and crowd-in private capital into transformative LCR projects. Highly concessional (soft) loans for projects with negative rates of return or below the normal market threshold. The GCF and the GEF provide concessional finance on similar terms to the CTF. The MDBs are also a source of concessional finance. However, this finance is less concessional than what, for instance the CIFs provide. Take IDA—the concessional arm of the World Bank—which provides loans on terms similar to highly concessional CTF finance. Yet, IDA is limited to low-income countries whereas CTF funds have been deployed in middle income countries where a lot of the LCR infrastructure is needed. In contrast, harder World Bank support in the form of loans from the International Bank for Reconstruction and Development are less concessional than the CTF. Those using the MCF to fill financing gaps for LCR infrastructure investments must recognize its scarcity as a source of ultra-concessional finance, with interest rates and maturities that are even more generous than MDB facilities. For example, the MCFs can support project preparation through technical assistance that helps countries incorporate climate goals into infrastructure plans. This could include developing the capacity to consider use of best available climate technology to reduce emissions. Multilateral climate funds can also help build consideration of the maximum 2-degree Celsius climate goal into the project preparation stage. Larger amounts of finance are needed at the project construction phase and it is at this point that high costs of capital can render infrastructure projects financially unfeasible. Blending finance from the MDBs and the MCF can reduce risks sufficiently to attract private sector capital into transformative climate technologies in developing countries. In addition to using the MCF to reduce the risk of LCR infrastructure, an improvement to countries’ enabling environments can also reduce the risk across the infrastructure project lifecycle. Interventions that aim to strengthen country’s investment environment and institutional capacity is often undertaken by the MDBs to improve development outcomes. The MDBs also support more targeted efforts to build an infrastructure- specific enabling environment, including through the establishment of a Global Infrastructure Facility to help governments develop infrastructure projects. Often this work, even when focused on infrastructure, is not specifically aimed at developing the capacity to build LCR infrastructure. This is where the MCF can be used to link MDB support for the enabling environment with efforts to boost country-level capacity to assess LCR alternatives and to help build a pipeline of LCR infrastructure projects. Co-financing occurs at the project level as well as the fund or facility level.6 For instance, the MCF invest directly in LCR infrastructure projects and in domestic financial entities (DFEs), which then on-lend to other LCR infrastructure projects. A complimentary measure of success in mobilizing private capital is the notion of leverage, which captures a larger financing envelope that includes additional resources committed either as a result of the infrastructure project or due to policy reforms that strengthen the enabling environment.7 For instance, this could include a renewable energy project that becomes viable as a result of the MCF investments in transmission and distribution (T&D). The CTF is the largest provider of blended financing amongst the MCF to date. Outcomes from CTF blending with MDBs and the private sector provides insights into the success of blending to achieve climate and development goals. Using data provided by the Climate Investment Funds’ Administrative unit, supplemented with desk research, this paper analyzes investments blending CTF and other public finance and its capacity to crowd-in private capital. The data encompasses 126 projects with CTF financing of $5.25 billion. This is broken down into 70 private projects with CTF financing of $1.89 billion and 56 public projects with CTF financing of $3.63 billion. The following conclusions that link allocation of finance and investment risk levels are tentative, as the allocation of a risk level to a given investment takes into account local and project specific factors that limit the ability to compare risk levels across investments. The available data is also more detailed for public investments where data on risk levels is available. Data on risk levels are not available for investments into private projects, such as those undertaken by the IFC. The majority of CTF finance was in the form of soft loans, which also went toward investments with the highest risks. CTF share of total finance (public and private) was highest for projects with the highest risk level. The CTF was most successful at mobilizing private finance for investments with the highest risk. Data on CTF financing of private investments shows that a given amount of CTF finance mobilized higher amounts of private capital than was the case for public investments. However, this is to be expected, given that MDB private sector investments are mandated to mobilize private capital. In addition and as discussed, some CTF financing of public projects such as T&D might not initially attract private captal, but can leverage further investments in LCR infrastructure, such as a renewable energy project. This paper also distinguishes between two broad types of CTF investments—direct investments in projects and indirect investments in DFEs, such as local banks and facilities that then on-lend to LCR projects. Investments in DFEs captures some of the impact of investing in capacity building and improving a country’s enabling environment. Investments in DFEs also captures one dimension of how initial investments can leverage additional private capital. Investments in DFEs tend to be smaller and in areas such as improving energy efficiency or distributed solar projects. This is in contrast to larger direct investments by the CTF into LCR infrastructure projects such as concentrated solar or wind energy. Investments in DFEs often include capacity building as well as a loan or guarantee. For instance, CTF finance helped build the capacity of national development banks in Mexico to evaluate large-scale wind power projects and in Turkey the CTF supported the development by financial intermediaries lending for energy efficiency. Multilateral climate finance will remain a small part of the financing needs for LCR infrastructure. Blending the MCF with MDB finance has reduced LCR infrastructure risk and crowded-in private sector finance. To address LCR infrastructure needs going forward will require the MCF to push into high risk climate projects that would not otherwise be viable, even with MDB support. Approaches that effectively deploy the MCF are evolving fast. As the MDBs ramp-up their climate financing and are guided by the cascade approach to finance, which emphasizes risk mitigation before direct loans, the MCF should be prepared and able to address the remaining financing gaps. High private co-financing can signal a lack of risk taking by multilateral lenders and could even indicate some crowding-out of private sector investment. There is no inherent link between high private co-financing and climate outcomes. This suggests that there are projects with higher risks where private sector appetite is limited but in which environmental payoffs are significant. There is also a role for including leverage ratios in assessing how the MCF has been mobilizing private sector capital. Such ratios are harder to measure than co-financing ratios, but are likely to be an important channel by which MCF will scale the financing needed for LCR infrastructure. This also underscores the importance of addressing the enabling environment for LCR infrastructure. Strengthening the enabling environment will reduce LCR infrastructure risk across the project cycle, creating additional opportunities for private capital to finance such projects. This should free up the MCF to invest in even higher risk and transformational LCR infrastructure projects. Loan Handbook for World Bank Borrowers.